After placing my order, I find my partner sitting in the ‘Hipsters Corner.’ There are no Hipsters in sight, and my partner definitely doesn’t cut the grade sans bushranger beard and weird haircut, it’s just that the sign says so. As I pull up my Astro Turf covered wire pew and place items that roll off a table placed at an impractical angle for a table, I am told we are staying put, as it’s the sunniest place in the house. And who doesn’t love a bit of winter sun? Squeeze & Grind on Camden’s main drag is a cool looking place so I am surprised to see a breadboard of scones sitting on the counter. My spread arrives looking very impressive and after I manage to stop it from rolling off the table I take a closer inspection. The whole thing is unnecessarily over sweetened. I know it sounds ridiculous, but sickly sweet chocolate sauce that is more at home on a kiddies sundae should not be served anywhere near a scone – cross-contamination of flavours that do not pair well is inevitable. The jam is super sweet rather than fruity and the sugary cream is straight from a can. 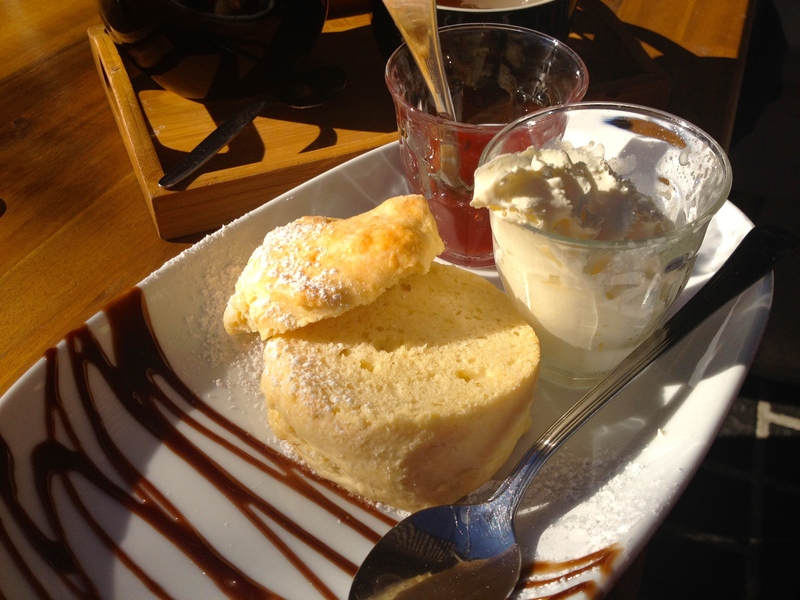 The scone isn’t bad, actually with the right accompaniments it would taste great, but the sickly chocolate syrup, jam and cream are overpowering. I like the fact that diners can sniff and choose their tea of choice from the row of loose-leaf teas displayed in small spice jars on the counter. Tea: An interesting range of loose-leaf teas served in a good-sized pot. Overall: A cool hip hang out.